♥ 100% brand new and high quality. ♥ The eye patches are used during the eyelash extension process for client comfort. 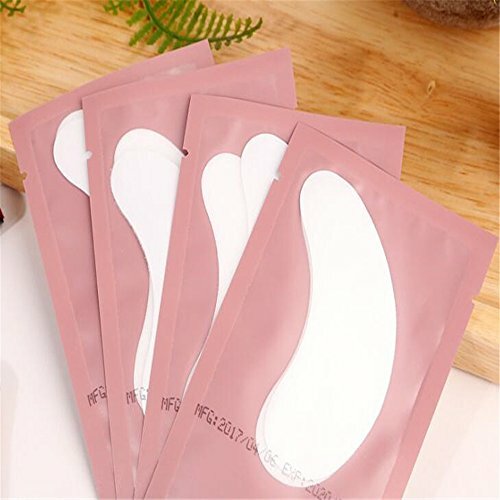 ♥ These Eye patches stimulate the skin's collagen to brighten the skin under the eye during the eyelash extension treatment. ♥ The Firming and Brightening Eye Patch uses the patented technology that slowly releases moisture and nutrients to your eye area by harnessing the warmth of your skin. As a result, your under-eye area is more hydrated, less puffy, your skin elasticity is improved and your dark eye circles diminished over time. When used during the eyelash extensions service, it holds down the lower lashes while giving a luxurious treatment to the under eye area. As it is lint-free, there are no stray strands of lint or fiber to spoil the look of your eyelash extensions. Majestic Pure Blue Eye Gel, Reduces the Appearances of Wrinkles and Dark Circles - Eye Cream Formula for Skin Tone and Resilience - 1.0 fl. oz.